If you’ve been keeping up to date with recent blog posts you’ll know that I’ve recently started a new job and left my beloved Soho behind. Okay, so Fitzrovia is hardly a million miles away, but it means I’ve got a whole load of new restaurants and cafés to explore. Yesterday evening I began doing just that when I visited Bellaria for a spot of dinner. 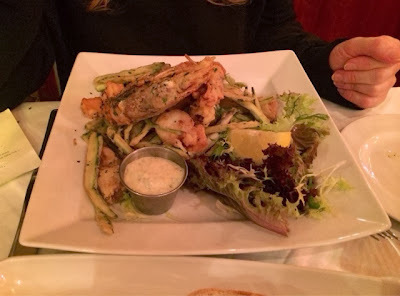 My sister has worked up in this area for a while and so I let her pick the restaurant and she booked Bellaria as they’re currently offering a 50% off starters and mains deal on toptable. The deal didn’t include items listed as ‘signature dishes’ but we were informed by the waiter that if we did want to order any of these they’d be 25% off. What a great deal! The small restaurant sits on the corner of Great Titchfield St and Langham Street directly opposite another Italian which I’m yet to investigate. The dining room has quite a classic decor with clean white table cloths suggesting perhaps a bit more of an upmarket experience than your average trattoria or pizza/pasta restaurant. The staff were attentive and not snobby about the fact that we’d booked on a deal and the service was excellent. The waiters regularly topped up our wine glasses if they came by and noticed we were running low. Sometimes this can get annoying as you feel as though you’re being watched for every sip you take but the staff at Bellaria managed to do this in such a relaxed and casual manner that we barely even noticed. Before our starters a selection of fresh bread was brought to our table with dipping oil and vinegar which was a very nice touch. 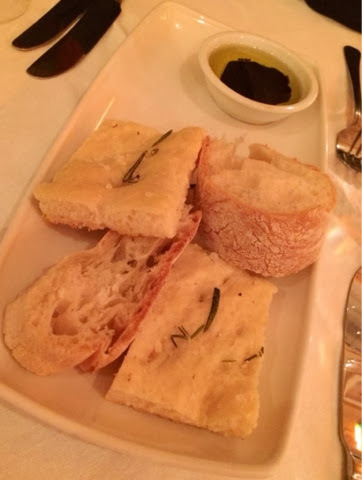 The focaccia was particularly tasty. One of the things I really liked about Bellaria is that the menu wasn’t the standard Italian menu you see absolutely everywhere and the starter selection was particularly unusual. 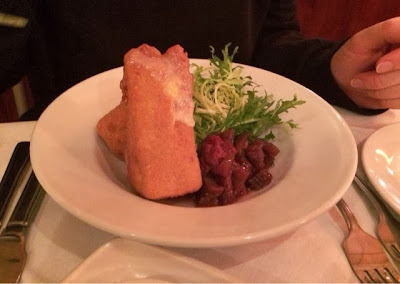 There were a couple of classics, but with a twist like this battered Brie that my sister had which came with a strawberry and aubergine compote which is really interesting. The dish came with two pretty sizeable chunks of Brie so it was a good sized portion. 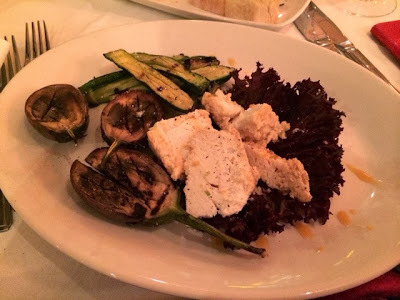 I went for the grilled baby aubergines and courgettes served with homemade ricotta cheese. I’ve never really had a dish like this before so it was really enjoyable going for something new. The homemade ricotta was absolutely delicious and had a sweet smoked flavour which complimented the aubergines beautifully and you can’t beat a nicely grilled courgette. All in all a delightful plate of tasty morsels. 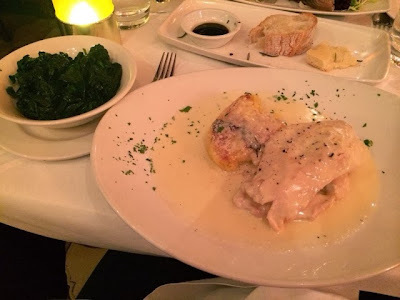 I had a really tough time deciding what to have for my mains and eventually went for the chicken escalope with gorgonzola sauce which came with a potato dauphinoise and I ordered a side dish of sautéed spinach. There was a lot of the gorgonzola sauce which was really tasty but quite strong, so by the time I’d finished eating my chicken I had had a bit too much of it, but I do think it was balanced well with the dauphinoise which wasn’t overpowered at all. The chicken was moist and juicy and the spinach garlicky and delicious. I’m glad I opted to have a side dish, just to help with the balance of the sauce with the other flavours. Overall a good dish though. All of our food was delicious, but another notable highlight of my evening was the service, friendly and helpful and just the right amount of attentive that doesn’t result in it being all too much. Dessert was skipped last night as we couldn’t possibly manage it, but there are absolutely loads of things I want to try on the menu at Bellaria so I’m certain I’ll be popping in again for another midweek dinner in the not too distant future. I definitely need to get stuck into some of their homemade pasta. – Make sure you're signed into Urbanspoon. – The snippet should be 2-3 sentences (quoted from your blog post) that gives an idea of what's in the post.